Well 2 years on and a few nights in our tent I feel it is time to move onto a better solution for Moke travel. 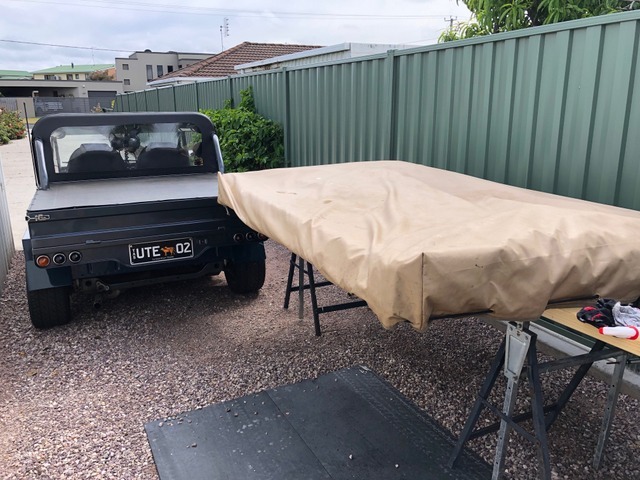 With a few longer trips planned over the next 2-3 years I have convinced by project assistant that a towbar can be fitted to M-ute so a camper trailer is planned. Almost certain that we will purchase a trailer camper tent and make the trailer ourselves. 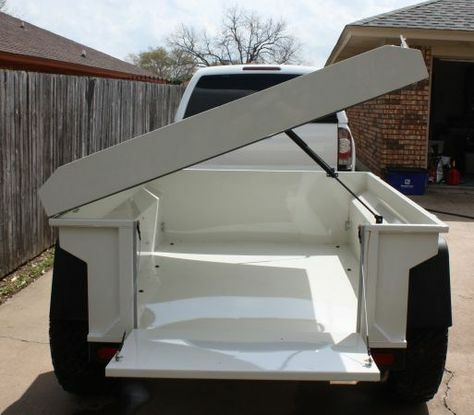 With the already heavy weight of the M-ute tray, weight will be number 1 priority with decent size double bed a close 2nd. Have seen the recent forum entries by Halfpint and Coxy along with a good look at Smithy's and communication with Woody, there appears to be many options however keen to hear what others have done or are considering. 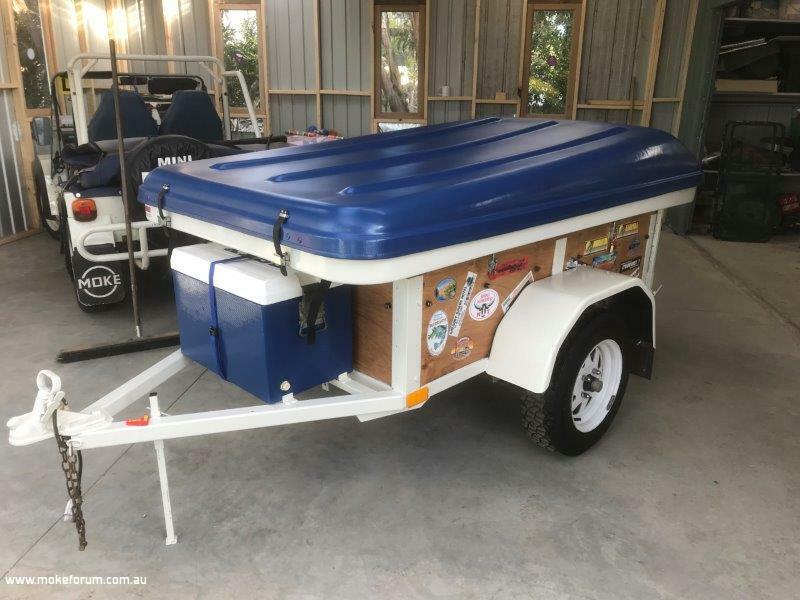 Ive spent a fair bit of time looking at Youtube vids related to roof top, trailer tents, light camper trailers etc etc and there is some really good ideas out there, very clever. 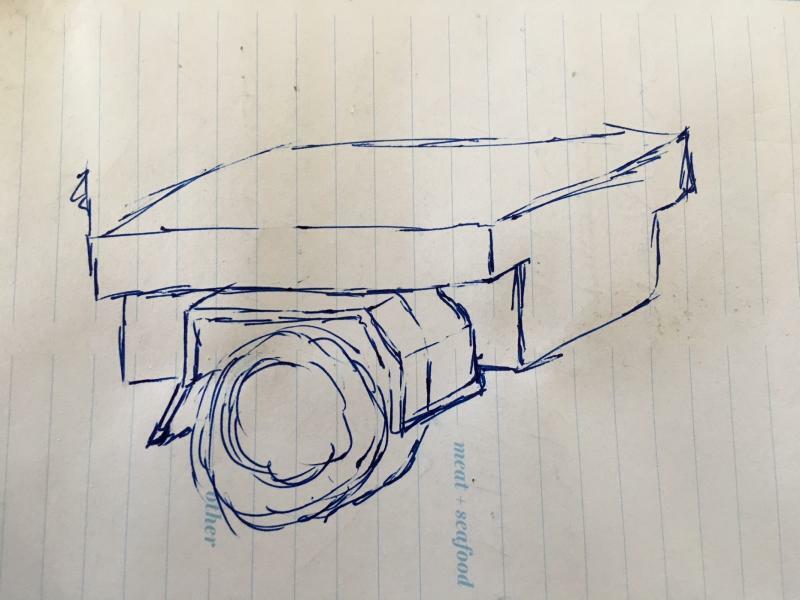 Just adds ideas. I would put a vote in for Coxy's Mk2 camper after having spent a week or so with it. 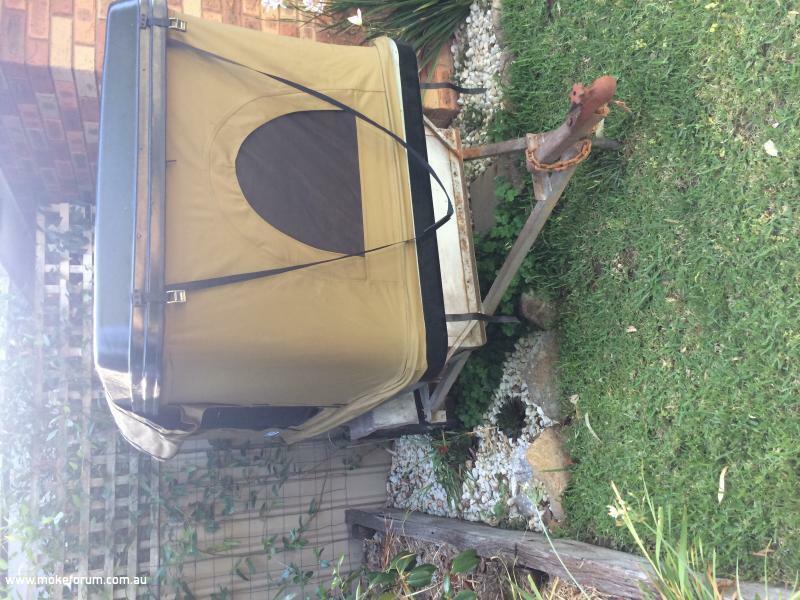 Much the same pod arrangement as Boydie's but with the flip top convenience of a deep trailer that held an esky and plenty of food etc. The tent has been purchased, an Oztrail Camper 6. From photo below I think a trailer will be needed. 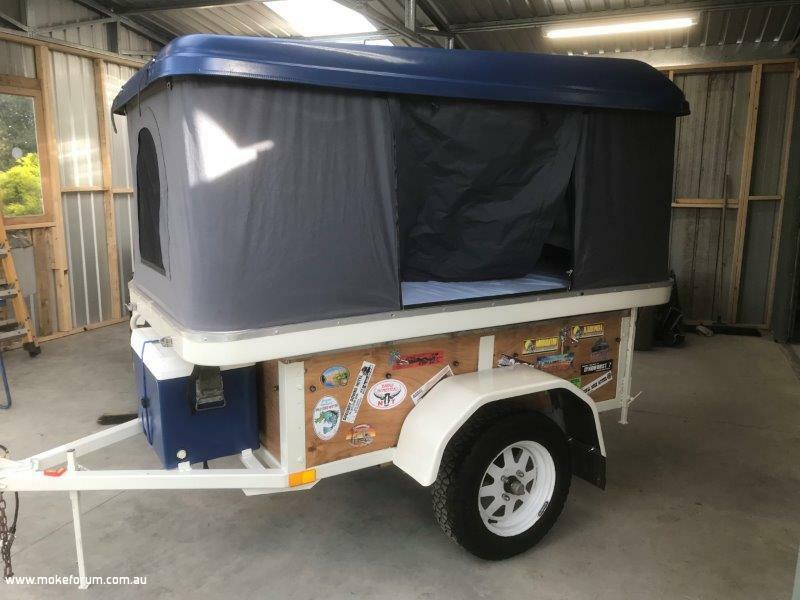 Interested to hear if anyone has used this camper tent and information on the trailer build to accommodate. Camper 6 width is slightly less that overall width of M-ute with its wider guards. Before we start building the trailer interested in feedback on what design people have already used? Weight of your trailer, suspension type, material used. Rod, what does your tent weigh? I made (well mostly made) a trailer from the back half of a Moke, cut across behind the front seats. It has the original sheet metal, as well as a steel box section frame at the front to support more sheet that closes off the opening. I used the rear subframe, suspension, etc. The problem is that it ended up pretty heavy. If you go with the prospect that a Moke is only allowed to pull 400kg and that what you tow also cuts into your payload (does anyone know the GCW of a Moke? ), its going to be important to keep the base trailer as light as practical. For suspension, it would be worth considering some of the independant suspension units that they like to use in the UK. 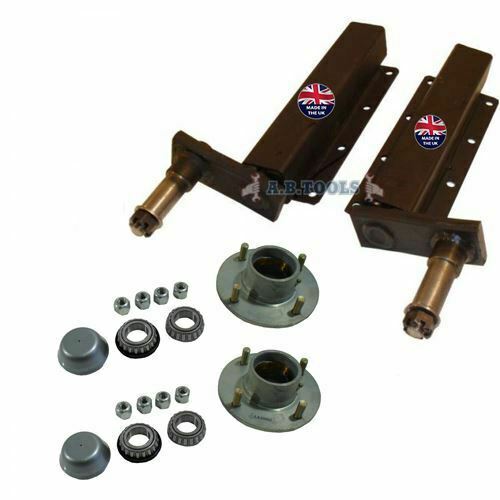 Something like the set below is rated for 500kg and has a 4" stud pattern the same as a Moke. They would be pretty light, I would guess they'd be lighter than a traditional semi-elliptical spring and axle setup. Thanks Tim, found their website and need to explore. 100kg for tent and then working on another 100kg for stuff such as WEACO, 2nd battery etc. so trailer construction weight critical. in the set up pictured by Tim, the centre of the hubs are likely to be too large for the centre hole of the Moke standard and Sunraysia rims so it may be worth looking at an axle that allows you to run the standard Moke Hub assembly. Just one thing to remember when building a camper trailer for your Moke, weight, weight, weight. I'm lucky enough to have an amazingly brilliant rebuilt 1275 Engine that can tow this weight very well and with Disc brake front end I can pull it up very well but I wouldn't tow it very far with a smaller size engine as the hills will kill you, but you can't have to lighter trailer or it will fall apart on dirt roads, my trailer has been on the Birdsville Track, Oodnadatta Track and some other challenging tracks, I have never worried about it as it's built tough and heavy and always handles the conditions, light weight trailers will be airbourne to much and you could well be leaving it up a track broken in two. But don't let this put you off as our trailer has been the best accessory I have ever built for the Moke and luv using it so get designing and keep us all in the loop. Cheers Coxy. Not true actually. I have the same suspension units on my trailer as those Tim posted. Standard Moke and Mini steel wheels slip right on the hubs. Okay, thanks for clarifying. I thought they looked like the hubs on SpiceMokes trailer. THis is what I am building. Although I had a recent major issue with my build, which will require some rework. Hi Brett, that looks good. I like the suspension your using (thanks Tim for the link). Hope the issue isnt too big. Have you weighed your trailer yet? 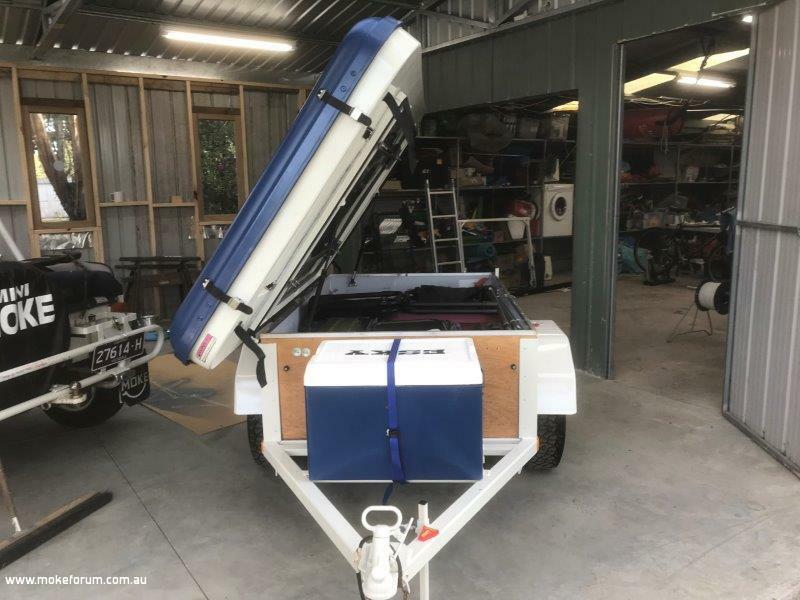 I finally weighed mine the other night with the roof top camper, all my sleeping gear and battery system and it came in at 260kgs. Like you Coxy, Ill still put a few camping bits and bobs inside, but want to keep it as light as I can. We had a thread a few years back about weights and towing that has a bit of good info in it here.